Okay, so first of all, it was a warm weekend, and I was able to get my trailer up to a balmy Plus 15C! Oooh, all without trying too hard. I was even able to melt some of my stores of water that had been frozen solid since new years. This was done by simply putting them in the sunshine all day. By the way, ice melts faster in water, than it does as a block standing alone, so when melting ice, don’t drain the water. All in all it was a decent weekend and I was able to stay in my trailer and get some writing done. True, it wasn’t in my Western Home, and so my slide-out was in, but you can’t have everything. What also aided the situation was the fact that my current laptop is newer, has better batteries and charges in about two hours. So, I could run on its batteries for a few hours and then plug in (with the inverter) and keep working as I charge the laptop’s batteries. I could keep doing this. I also took breaks now and again and yes got out of the trailer for a few walks. I was even able to shed my thermal underwear and just lounge around in sweat pants and a T-shirt. All in all it was a nice break from the cold, and this break should last this week and then the cold returns. How cold it gets is anyone’s guess, but according to the weather predictors “the worst of winter is behind us.” Again, this also shall remain to be seen. One thing is certain, no matter what life tosses at me, I will take it in stride (or at least do my best to do so). If I can’t take it in stride, I will at least try to take it with some decorum and style (as I fumble, bumble, fail, getup and try again). Oh, what was that? What about that “Omen” I mentioned in the title? 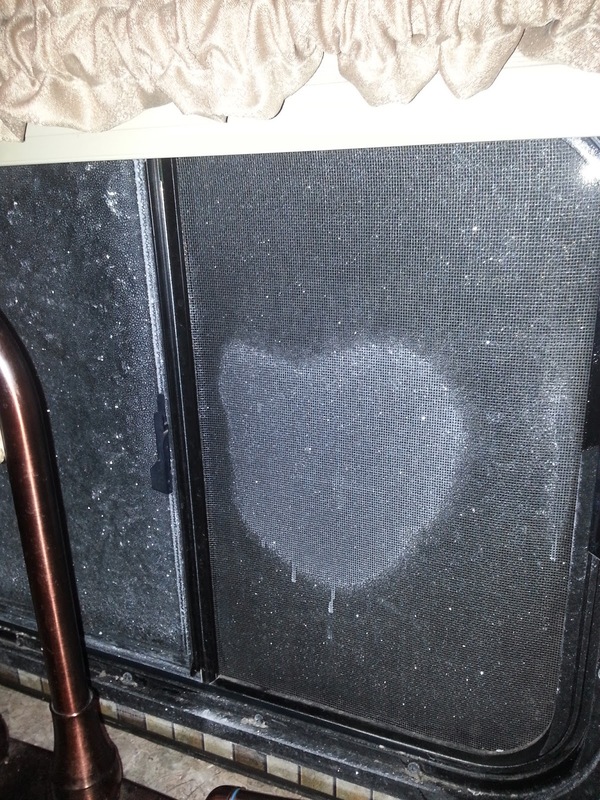 Well, you see when it gets below freezing in my trailer (as it did overnight) the windows freeze up. Sometimes I can see patterns in them. This morning when I was making my morning coffee, I saw this . . .
You can clearly see a heart there, so to me that means that love is right around the corner. Yep, sure, indeedy! Sure, sure, it is just a frozen pattern on a window so, technically it means nothing. It means as much as seeing shapes in the clouds. I am doing my best to keep a positive attitude as of late and so far it is working. So, whilst I would not wish this lifestyle on anyone, it seems that there is a lady out there for me . . . who knows, I may just get my “s” after all.